Joining the Association of Southeast Asia Nations (ASEAN) in 1995 is a major milestone in Vietnam’s door-opening and integration process in order to materialize the VIIth National Party Congress’s guideline on “diversification and multilateralization of economic relations with every nation”, “creation of a favorable environment and conditions for foreigners to invest or do business in the country”, and “accession to other international economic organizations and associations when necessary and conditions permit.” Over the past twenty-one years, Vietnam has actively and proactively participated in the ASEAN economic integration and, together with other ASEAN member countries, in laying down important foundations for the ASEAN Economic Community (AEC) to be officially founded on December 31, 2015. So far, ASEAN has become one of the top trading partners and a key impetus for Vietnam to maintain its economic growth over the past years. Regarding trade, the General Department of Vietnam Customs’ statistics show that the two-way trade value between Vietnam and ASEAN had grown annually 14.5 percent on average, from USD 3.3 billion in 1995 to USD 42.1 billion in 2015. ASEAN has become Vietnam’s second largest trading partner after China. Regarding Vietnam’s exports to ASEAN, with an average growth rate of 17.1 percent during the last years, the country’s export turnover had surged from nearly USD 1 billion in 1995 to USD 18.3 billion in 2015. Currently, ASEAN is Vietnam’s third largest export market after the United States of America and the European Union. Commodity items exported to ASEAN have become more diverse. In addition to crude oil and rice, two major commodities exported to ASEAN before 2010, Vietnamese enterprises have exported many other products to ASEAN, such as cell phones and accessories; computers, electronic devices and accessories; iron and steel; machinery, equipment, tools and spare parts; footwear and garments, seafood, coffee and rubber. In the opposite direction, the average annual growth of Vietnam’s imports from ASEAN has reached 13.4 percent in the past years, bringing the import value from USD 2.3 billion in 1995 to USD 23.8 billion in 2015. ASEAN is now Vietnam’s third largest supplier of goods, after China and the Republic of Korea. Generally speaking, Vietnam is running a trade deficit in its trade with ASEAN. In investment relations, ASEAN is Vietnam’s important source of foreign direct investment as well as a bridge for many investments from multinational firms based in ASEAN. ASEAN member countries with large investments in Vietnam include Singapore, Malaysia and Thailand. Meanwhile ASEAN is also a traditional market of Vietnamese investors. Behind the above figures are Vietnam’s unceasing efforts to integrate with ASEAN economies, with the official establishment of AEC being a significant milestone. By the time of the AEC establishment, many important commitments had become effective for Vietnam. Regarding trade in goods, under the ASEAN Trade In Goods Agreement (ATIGA), Vietnam has applied the zero percent duty rate to about 90 percent of tariff lines and will abolish about 97 percent of tariff lines and tariff quotas before 2018. Meanwhile, about 99 percent of Vietnamese exports to ASEAN-6 countries have been exempted from import duty since 2010. Besides, ASEAN is pushing ahead with the implementation of mechanisms to lift non-tariff barriers, such as consultation and dialogue. Trade facilitation has also been promoted with many important initiatives, such as the ASEAN single-window customs mechanism, self-certification of origin of goods, the ASEAN trade repository, etc. Currently, Vietnam, Brunei Darussalam, Indonesia, Malaysia, the Philippines, Singapore and Thailand have partially or entirely built their national single windows and pioneered in the connection with the ASEAN single-window mechanism. Vietnam has also implemented the pilot project on self-certification of origin of goods within the bloc. Regarding trade in services, under the ASEAN Framework Agreement on Services (AFAS), Vietnam and other ASEAN member countries have reached an agreement on nine packages of common commitments on trade and services, six packages of commitments on financial services and nine packages of commitments on air transport services in line with Vietnam’s strategy on development of service sectors and current law. ASEAN is also striving to finalize subsequent commitment packages and negotiate to upgrade the AFAS into the ASEAN Agreement on Trade and Services in the future. 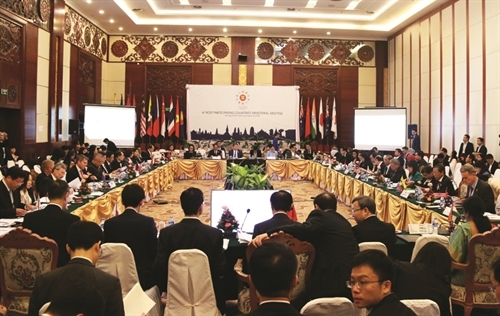 Commitments of Vietnam and other ASEAN member countries on services in order to realize the AEC are higher than Vietnam’s WTO commitments (WTO+), which will increase the intra-bloc flow of trade in services, especially in the fields prioritized for integration, such as air transport, information technology, healthcare, tourism and logistics. In order to facilitate the movement of skilled labor within the region, Vietnam and other ASEAN member countries signed the 2012 ASEAN Agreement on the Movement of Natural Persons and eight Mutual Recognition Arrangements (MRA) within the ASEAN framework on such professional services as technical services (in 2005), nursing services (in 2006), architectural services (in 2007), monitoring and assessment certificate (in 2007), medical practitioners (in 2009), and dental practitioners (in 2009), the framework agreement on accounting (in 2009) and then the MRA on accounting (in 2014), and tourism (in 2012). These commitments aim to facilitate only the movement of skilled labor within the region, but not manual labor. Regarding investment, Vietnam and other ASEAN member countries signed the ASEAN Comprehensive Investment Agreement (ACIA) in 2009 and are continuing to review and abolish restrictions on investment. This effort will help increase intra-ASEAN investment, directly affecting the economic growth and employment of all ASEAN member countries. It will also indirectly impact the attraction of outside foreign investment into the region, the increase of trade flows among ASEAN member countries and each state’s need to improve its investment environment. The passage of the amended Investment Law and amended Enterprise Law by the National Assembly in 2014 is a significant step of the country to prepare for deeper integration in the field of investment and for increased investment within the framework of the AEC. In the field of investment promotion and liberalization, Vietnam and other ASEAN member countries have recorded certain achievements, such as publishing investment manuals for businesses and annual ASEAN investment reports, organizing conferences and forums on investment promotion, building an ASEAN website on investment, among others. In general, the implementation of commitments to build the AEC has brought about many benefits to the governments, businesses and consumers of ASEAN. However, it should be noted that the regional economic integration did not finish in 2015. To achieve the objective of deeper and wider integration, ASEAN leaders have adopted the AEC Blueprint 2025 consisting of five characteristics: (i) a highly integrated and cohesive economy, (ii) a competitive, innovative and dynamic ASEAN, (iii) enhanced connectivity and sectoral cooperation, (iv) a resilient, inclusive, people-oriented and people-centered ASEAN, and (v) a global ASEAN. Deeper integration into the AEC in the coming period will bring about both new opportunities and challenges for Vietnam. Regarding opportunities, tariff barriers will be lifted; non-tariff barriers will be reduced to facilitate the movement of Vietnamese goods, services, capital and skilled labor within the ASEAN region. Not only will an opportunity to access and expand the intra-regional market with around 625 million people and an annual GDP of USD 3 trillion be opened up, ASEAN is also an intersection of many bilateral trade agreements between the region and external partners and other regions across the world. Hence, businesses can access to external markets with great economic scale, such as China, the Republic of Korea, Japan, Australia, New Zealand, India and Hong Kong via existing FTAs of ASEAN+1, and the ASEAN-Hong Kong Agreement and the Regional Comprehensive Economic Partnership (RCEP) in the future. Deeper service integration will help boost the development of Vietnam’s local service market, raise the competitiveness of Vietnamese service providers, especially those providing potential services such as tourism, air transport and logistics. This will actively contribute to the country’s economic restructuring process. Vietnam will also have more opportunities to attract foreign direct investment from ASEAN and external partners through improving and increasing the attractiveness of the market. Concurrently, capable local businesses will also have greater chance to expand their investment to ASEAN member countries. Strengthening the AEC is synonymous with strengthening the status of Vietnam in relation to other countries in Southeast Asia and the world, helping the country to transform the economy and gradually join in regional and global supply chains, contributing to realizing the goal of economic restructuring and national industrialization and modernization. Through the AEC, Vietnam will make optimum use of opportunities to exploit projects on infrastructure development, serving economic development and enhancing the connectivity with other ASEAN member countries and partners. Regarding challenges, the country’s biggest challenge is competition from the liberalization and opening of markets, especially under the condition that other ASEAN countries have comparative advantages similar to those of Vietnam. Uncompetitive businesses will encounter difficulties in domestic markets and in entering and occupying other ASEAN member countries’ markets. Poorly performing businesses will not be selected to participate in high-profit stages of supply chains, but may only join processing stages. Low-skilled workers will find hard to rise up to managerial positions or become highly paid experts, or to freely travel and seize good opportunities created by commitments on regional economic integration. However, from a positive perspective, this pressure will force Vietnamese businesses to enhance their competitiveness, and domestic workers to improve their skills in order to participate in the ASEAN and other regional markets. The implementation of ASEAN commitments also demands Vietnam to review and complete its legal system, enhance transparency, improve its business and investment environment and run its economy more effectively. In order to make best use of opportunities and overcome challenges, the AEC integration process must go hand in hand with drawing on the domestic resources and increasing national competitiveness. The most important solutions is to build up long-term capacity for Vietnamese businesses and workers in the context of comprehensive integration. To implement this solution, the Government should further administrative reforms, focusing on trade facilitation such as smoothly operating the national single-window mechanism and continuing to connect with other countries in order to establish the ASEAN single-window mechanism and redressing inadequacies in the fields in which Vietnam has low rankings: transparency of tax and customs policies and procedures transparency which is currently a comparative disadvantage of Vietnam with other ASEAN countries. The Government should step up public information work to raise public awareness and social consensus on the AEC establishment goal, further involving the mass media in the dissemination of information about international economic integration among all stakeholders. At the same time, the Government should study and reorganize vocational training institutions and develop education programs to better meet the requirements of regional and international integration and improve domestic workers’ professional capacity, foreign languages, life skills and health for effective participation in the ASEAN labor division. Besides, Vietnam needs to attach importance to attracting financial and technical assistance and investment and experts from more developed countries in the grouping in order to accelerate the process of technology transfer and to improve the quality of goods and services, creating a momentum for Vietnam to develop to a level on par with regional nations.